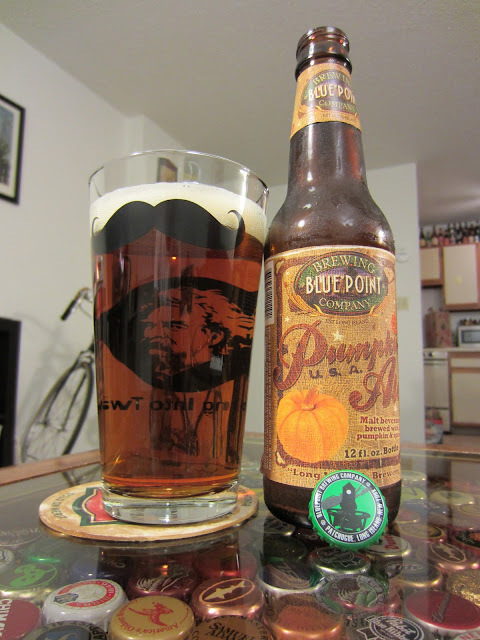 The Pumpkin Ale from Long Island-based Blue Point pours a crystal clear light amber body with a moderate orange glow. The medium-sized light tan head is slightly creamy with moderate retention, but leaves almost no lacing on the glass. Pumpkin is big on the nose with mild spices the give the beer a pumpkin pie-like aroma. Spices are dusty seeming with cinnamon, nutmeg, and a hint of allspice. A mild astringency tugs at the edges of the beer's nose. The beer has a tight carbonation up front that produces a full-ish mouthfeel. Sweet caramel malts build the base of the beer and work with prominent pumpkin flavoring. The beer's crispness subsides to big notes of the spices found on the nose. Allspice and nutmeg are the primary standouts. The beer is sweet and almost tangy on the finish with a dash of pumpkin and lingering spices to match a hint of brown sugar sweetness.